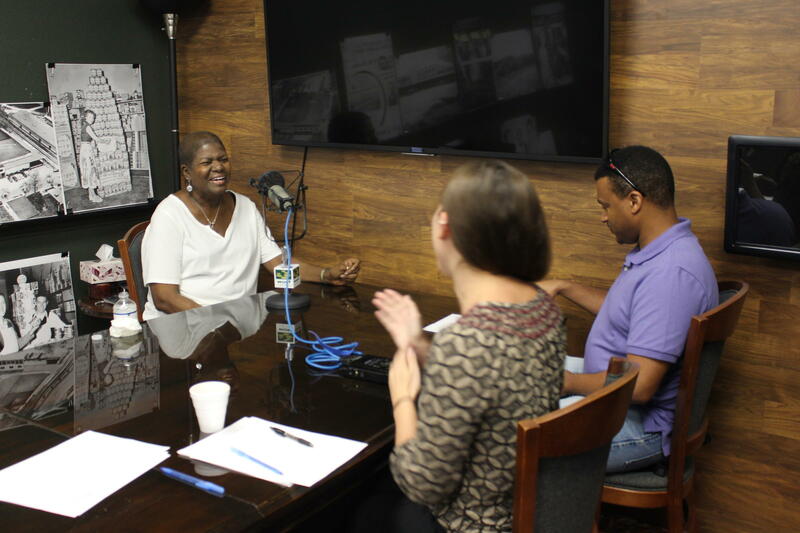 Janell Green Johnson (l) speaks to WUSF's Stephanie Colombini and USF student journalist Jeremy Wade at the Plant City Photo Archives. Interviews for this year's Telling Tampa Bay Stories took place at the Plant City Photo Archives and History Center. 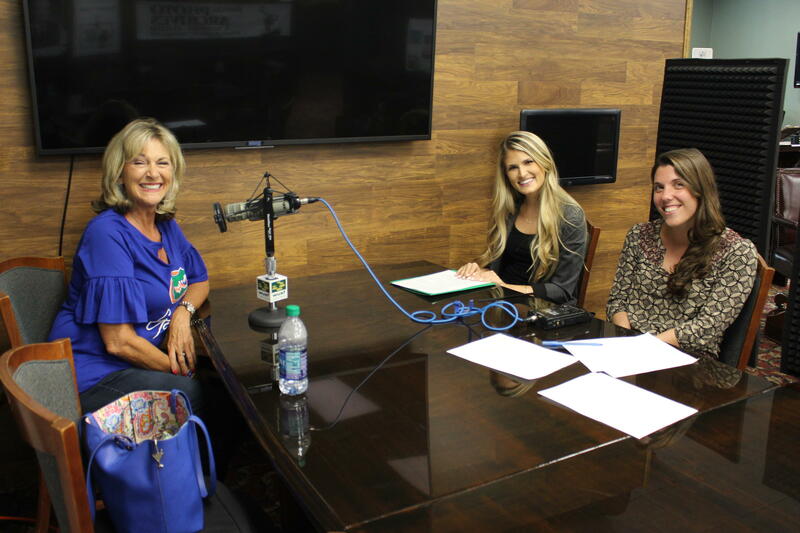 Judi Whitson, executive director of the Hillsborough County Farm Bureau (l) speaks to USF student journalist Natalie Eiland and WUSF's Stephanie Colombini. Cerenio Cervantes-Flores (l) poses with his parents and two of his sisters. 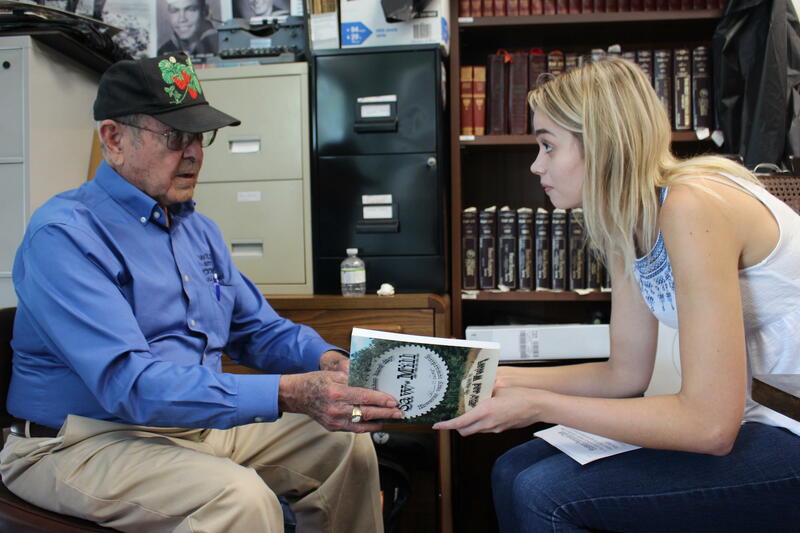 Plant City farmer Alvin Futch discusses his book, "Saw Mill," with USF student journalist Molly Urnek. USF student journalist Alexa Ignacio and Plant City businessman Ed Verner. USF student journalist Sam Newlon speaks to William Thomas, Jr. 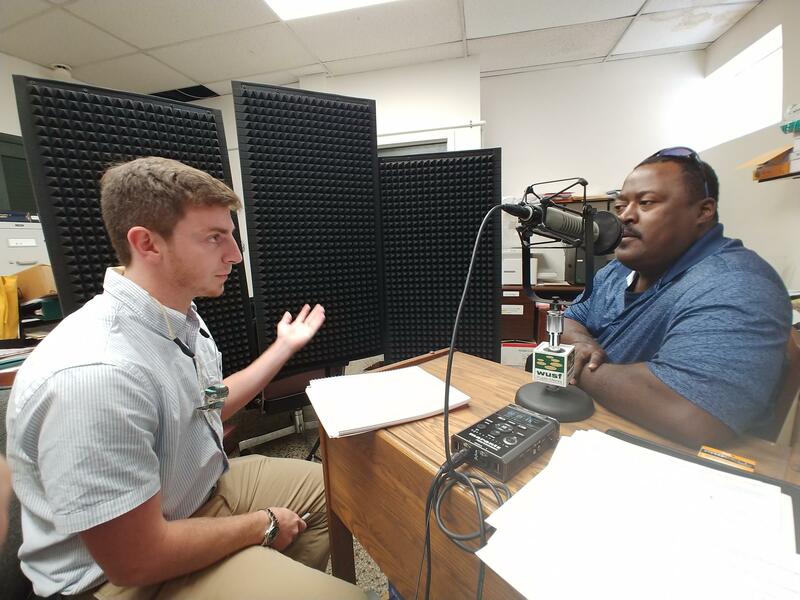 Since 2016, WUSF has teamed with University of South Florida student journalists to highlight communities in the area and the people who call them home. The first of a two-part series airs on this week's Florida Matters (this series originally aired in November and December 2018). You can meet some of the people the students interviewed here. Part 2, which highlights some of the places and events that make Plant City special, will air Feb. 12. First, here's a video overview of Plant City and the project, produced by USF student journalist Yara Zayas. Judi Whitson, executive director of the Hillsborough County Farm Bureau, has been working in Plant City for 27 years. Agriculture has played an important part in Plant City since it was incorporated in 1885 – and not just the strawberries it’s famous for. Click here to listen to Judi Whitson with the Hillsborough County Farm Bureau talk about the changing landscape of agriculture in Plant City. “The farmers are the same – they’re farming the same ground that their fathers and their grandfathers farmed before them, so that part of Plant City hasn’t changed a whole lot,” said Whitson. But a lot has changed, particularly in the last 20 years, due to greening – a disease that kills citrus trees. Judi Whitson, executive director of the Hillsborough County Farm Bureau, left, speaks to USF student journalist Natalie Eiland and WUSF's Stephanie Colombini. “When you see roots on all the trees up, it was just heart-breaking, because you knew that was another field that was gone, that was another grove that wasn’t going to be producing oranges for us,” she said. Much of the damaged citrus groves have been replaced by new crops: not just strawberries, but peaches, olives, avocados and blueberries. But in many cases, agriculture has given way to development, which concerns Whitson. Whitson was interviewed by Stephanie Colombini and USF student journalist Natalie Eiland. Whitson said a lot of the farming in Plant City is now being done by migrant labor, like the family of Cerenio Cervantes-Flores. 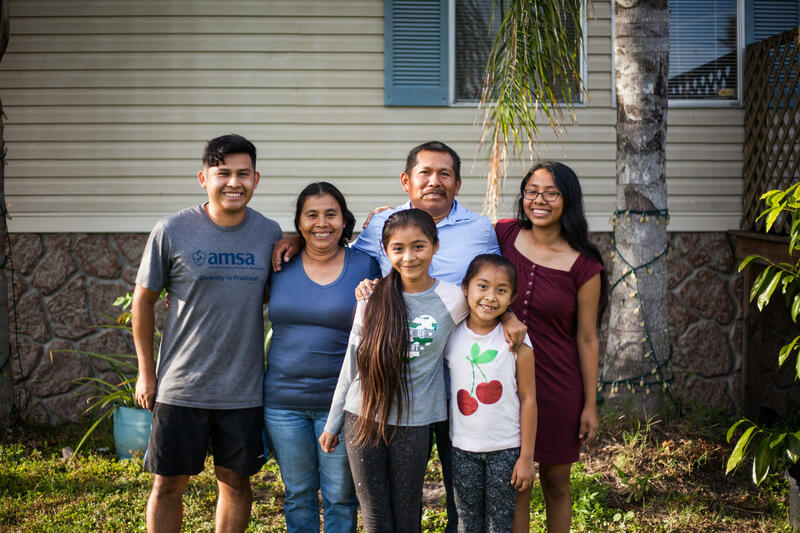 Click here to listen to Plant City resident Cerenio Cervantes-Flores talk about how his migrant farmer parents have shaped his life. The 25-year-old’s parents first came to Plant City in 2002, rotating between summers in Ohio and winters in Florida. “Here, there’s a lot of labor work, there’s a lot of strawberries that need to be picked, a lot of tomatoes that need to be picked, things other people wouldn’t do, so they fill that gap,” said Cervantes-Flores. Cerenio Cervantes-Flores, left, poses with his parents and two of his sisters. In their case, Cervantes-Flores’ parents have six children they’re raising. Their example is pushing Cerenio forward, as the recent biology graduate at the University of South Florida prepares to go to medical school. “That’s one of the motivations that I use to keep studying, go to school, hopefully get a good-paying job in the future and hopefully help them the way they’ve helped me,” he said. Cervantes-Flores was interviewed by USF student journalist Chaveli Guzman. Alvin Futch, 87, was born into a farming family – a business he still continues today. Click here to listen to Plant City farmer Alvin Futch talk about why he's keeping the family business alive. Futch and his siblings grew up on that farm with a variety of chores. “My brother milked the cows, my job was to feed the horses and my younger brother would feed the hogs and pump water for all the livestock every afternoon and every morning before we went to school,” he said. That began a lifetime in agriculture. “The ranch where we are now, my dad and mother put together 1,000 acres over there and we farmed 100 acres of it, growing feed crops for the cattle and growing corn for the horses,” said Futch. And Futch said that's not going to change anytime soon. Futch was interviewed by Mark Schreiner and USF student journalist Molly Urnek. Ed Verner started in agriculture, but has now moved into property development – including the renovation of Plant City’s downtown. Both jobs run in his family: his grandfather came to Plant City in 1919 as a 19-year-old and became involved in a number of businesses in town, including farming interests, real estate and car dealerships. Click here to listen to businessman Ed Verner talk about his family's decision to sell their farmland and how he has since been involved with revitalizing Plant City's downtown. As bad as the freeze was, the North American Free Trade Agreement (NAFTA) made things even worse. “It decimated citrus profits in this area by about 24 cents a pound solid, which back then, that represented about a 30 percent cut in what local growers were getting for their orange juice product,” he said. That pushed a lot of farmers out of the business. 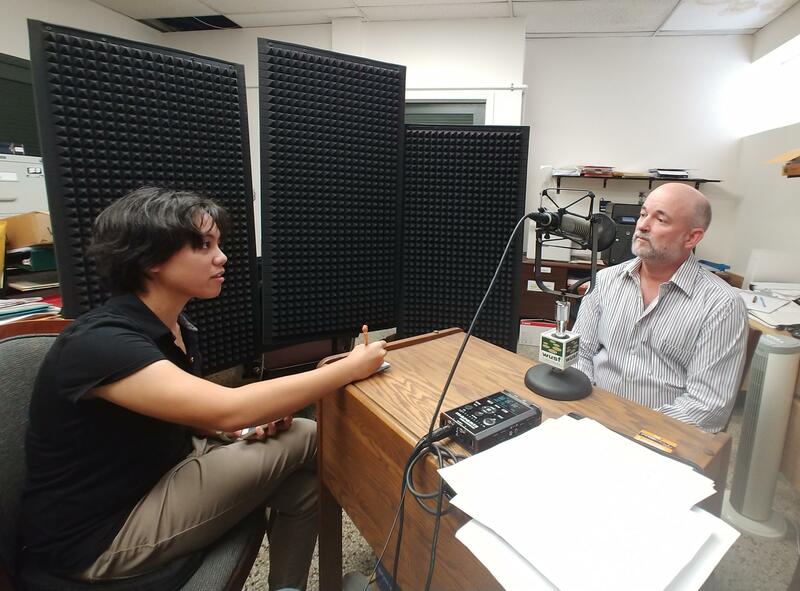 USF student journalist Alexa Ignacio interviews Ed Verner. While Verner was born and raised in Lakeland, he helped take over the family businesses in Plant City, with a special interest in downtown. Verner believes that’s made Plant City’s downtown a place to be – even while some say it can still get better. Verner was interviewed by Mark Schreiner and USF student journalist Alexa Ignacio. William Thomas, Jr. is president of the Improvement League of Plant City. One of the non-profit’s signature projects is the Bing Rooming House, an African-American Museum that served as a hotel for blacks during the era of segregation. Click here to listen to William Thomas Jr. tell the history of the Bing Rooming House, a National Historic Site that once served a hotel for blacks during segregation. The museum focuses on some of the more famous names who stayed there: musicians and athletes who weren’t allowed to spend the night in other hotels because they were black. “We always try to confirm, obviously, who stayed there. Muddy Waters was an often frequent guest there, he was notable in the jazz arena, a musician. We do have those who say James Brown stayed there, there are a lot of oral history accounts of that,” said Thomas. Other people stayed in the Bing House as well. Thomas said he saw some lingering signs of racial division in Plant City when he came home from the military in the 1990’s, but he feels things have changed. “I remember when (The Improvement League of Plant City) first took on the (Bing House) project and presented it to the city, there was a poll that was conducted through the Plant City Courier and that poll reached out citywide,” he said. “There was an 80 percent turnout that (the community) felt the Bing House was not a good idea. Thomas was interviewed by Mark Schreiner and USF student journalist Sam Newlon. Retired schoolteacher Janell Green Johnson is the granddaughter of the original owners of the Bing Rooming House. Click here to listen to Janell Green Johnson describe her experiences growing up as an African American in Plant City. Johnson said, even as a child, she was aware of segregation in Plant City. Janell Green Johnson, left, speaks to WUSF's Stephanie Colombini and USF student journalist Jeremy Wade at the Plant City Photo Archives. But even after schools in Plant City were integrated, Johnson said things didn’t totally change. “I can remember one day walking downtown and seeing a classmate who walked across the street so that they would not have to interact with me,” she said. “I was blessed in that I never saw anything horrific happen. I heard of things but never saw anything,” said Johnson. “Like I said before, I knew there were restaurants." “There's a restaurant right here, right now that I have never stepped foot in, because I grew up knowing during the time when I was young that if you wanted something you had to go to the back door,” she said. “I was not going to the back door. No one in my family was going to the back door. I've never stepped foot in there. “My husband was not raised here. He's been there and my son has been there. But I've explained to both of them why I don't go there. And that's just the way it is,” she said. Johnson thinks there’s been some changes for the better. She points to her relationship with a white woman who she’s been friends with since that woman first approached her while Johnson sat alone in the cafeteria on her first day at Plant City High School. Johnson was interviewed by Stephanie Colombini and USF student journalist Jeremy Wade. Telling Tampa Bay Stories: Plant City is a collaboration with journalism students at the University of South Florida’s Zimmerman School of Advertising and Mass Communications. Together, we hosted an interview session in Plant City at the Plant City Photo Archives and History Center to collect the stories featured in this two-part series. Special thanks to all those who shared their stories with us both on and off the air, and thanks to the employees at the Plant City Photo Archives and History Center for helping facilitate our interview sessions. Much thanks also to USF journalism instructor Jeanette Abrahamsen and Plant City Photo Archives Executive Director Gilbert Gott for the important roles they played in this series.